While Iwatani-san and his team were working on Puckman, Namco's engineers made a technological breakthrough: color. Previous videogames had all had single-color displays, with any "change" in the color coming from a cellophane overlay, like a colored gel in a stage light - shine a white light through a translucent red piece of plastic, and the light looks red. This was fine for coloring large, static sections of the screen, but useless for moving objects. However, while working on their Space Invaders knockoff Galaxian, Namco figured out how to make full-color sprites, which is why Pac-Man could be chased by different colored ghosts (they'd have been able to make the blue maze walls either way). Actually, he's not chased by ghosts. You may call them ghosts, and they're visually identical to ghosts, but officially they're "monsters" - it's right there in the instructions! Allegedly the inspiration for the game came from a children's story about a creature that protected children from monsters by eating them, so "monsters" these are. This one is Blinky, aka "Shadow," which is less of a nickname and more of a descriptor of how he moves: in Japanese, he's Oikake, "Chaser," and of the four ghosts, he's the only one programmed to constantly target Pac's specific location (lacking complicated AI algorithms, each of the ghosts tries its best to get to a certain part of the screen in relation to the player), meaning he's constantly shadowing your moves. For something that's "not" a ghost, Blinky sure looks a lot like a ghost. His body is a rounded lump with a few vertical wrinkles and a wavy lower edge. He has his hands raised in a threatening pose, while his eyes and mouth are simply black paint. 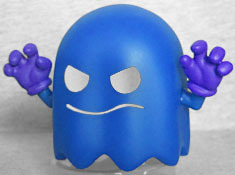 He comes in an identical box to Pac-Man, because that's how this line works, but it feels like Funko missed an opportunity for a chase variant: imagine opening the box, and instead of a deep red Blinky, you got a "scared" blue ghost instead. That'd ruin the 1/12 ratio that all the figures have, though. 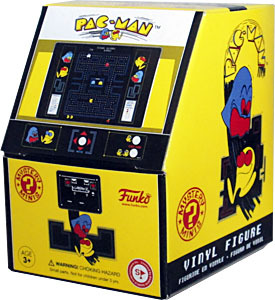 This entry was posted in blog exclusive review, Funko, videos and tagged Mystery Minis, Pac-Man. Bookmark the permalink. I just wanted to say that you got some false information in this. That is NOT the original arcade art for PuckMan. That is actually art for a bootleg version of PuckMan, so it is unofficial. 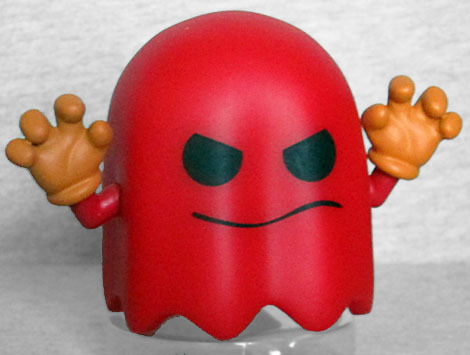 The OFFICIAL PuckMan artwork uses the design seen in this Mystery Mini. (With some small differences, like a longer nose and smaller feet.) 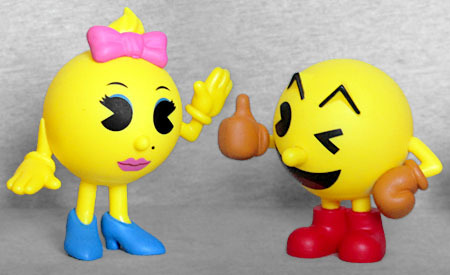 This design was used in all official Japanese artwork and merchandise for Pac-Man throughout the 80s, and also appeared in-game for official games. Starting with Pac-Land, and continued to be used in Hello! Pac-Man, Pac-in-Time, and most famously the Pac-Man World trilogy. This design also recently appeared in Super Smash Bros. So, this design for Pac-Man existed and has been used long before his 25th anniversary logo, as well as being around since the first game. (and before his name was finalized) So yeah, that creepy pink-lipped green-footed PuckMan is just an unofficial bootleg. Here is the official art. Wow, that's cool. Thanks for the correction! No problem! I’m always happy to share information on Pac-Man. I’ll also share something interesting about the enemies. While they were originally called monsters, the ghost name originated from the Atari 2600 version as a way to cover up the sprite flickering. The ghost thing was eventually adopted by Namco, starting with Pac-Man 2: The New Adventures. However, for a while they sorta went back and fourth between calling them ghosts or monsters, until they eventually just decided to stick with callimg them ghosts in around the early 2000s. This is especially apparent in the reboot series Pac-Man and the Ghostly Adventures, where it is explicitly explained that the ghosts are actual spirits of dead pac-people. Also, the reason Pinky is listed as “Ms. Pac-Man Ghost” and has a different art style is because it’s based on the ghost seen on the Ms. Pac-Man arcade artwork from Midway, same for Ms. Pac-Man herself. (although her design is sort of a combination of her Midway design and her official Namco design) Blinky just looks like he does in most games, hence why he’s just listed with his name.